Aerial view of the Espy Run Constructed Wetlands project. 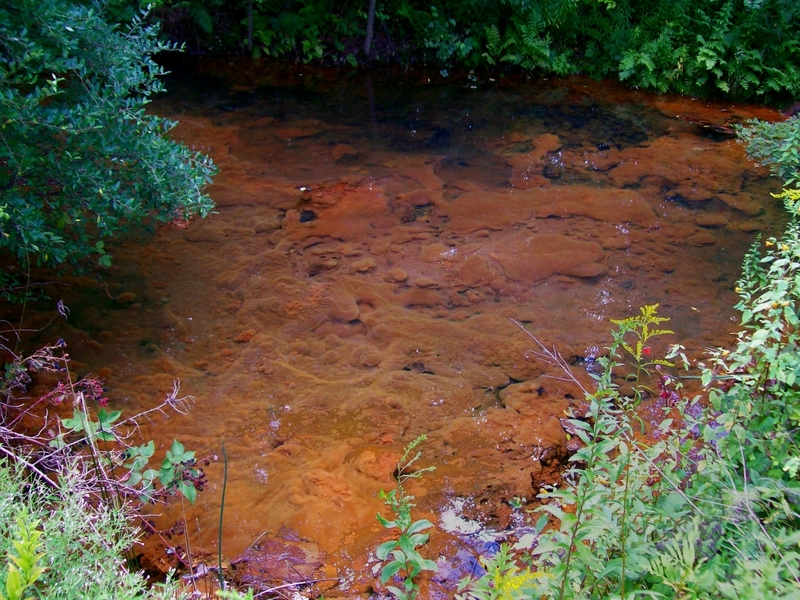 The movement of water into the pond adds oxygen to the water, accelerating the precipitation of iron from the iron hydroxide suspension. 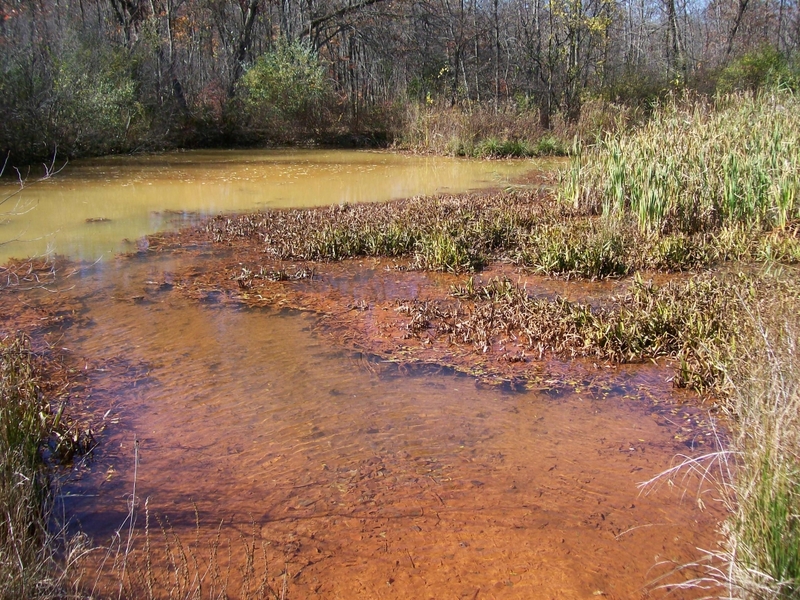 The containment of water in the pond increases the time iron particles have to settle to the pond’s floor. 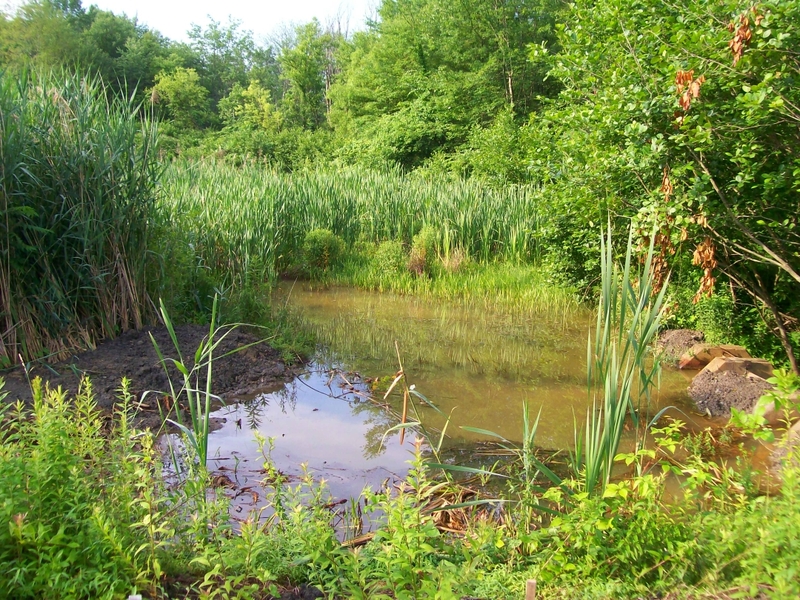 Natural vegetation in the pond, such as grasses and cattails, filter iron and trap it. Using this design, Earth Conservancy constructed its first wetlands system in 1996. 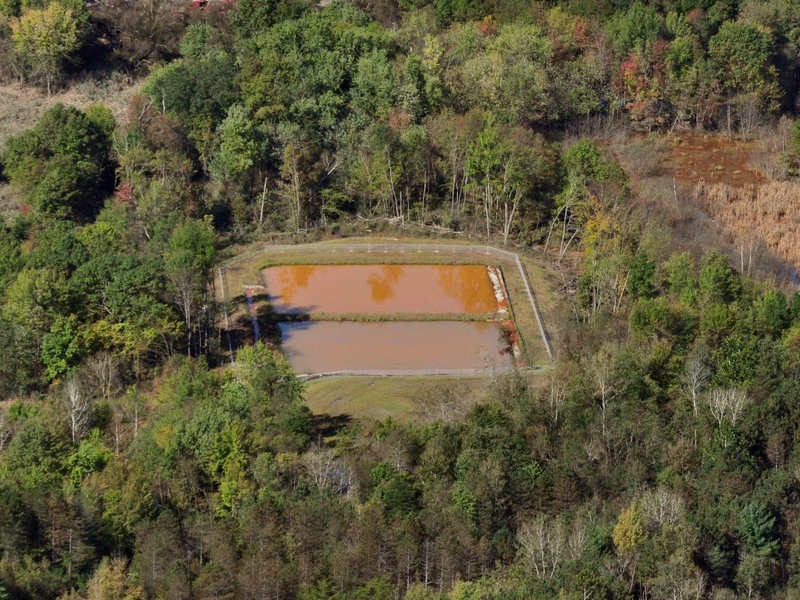 Located in the Loomis Park area of Hanover Township, the Phase I wetlands was to address iron-laden waters flowing from a seep near Espy Run, a tributary to the Nanticoke Creek. 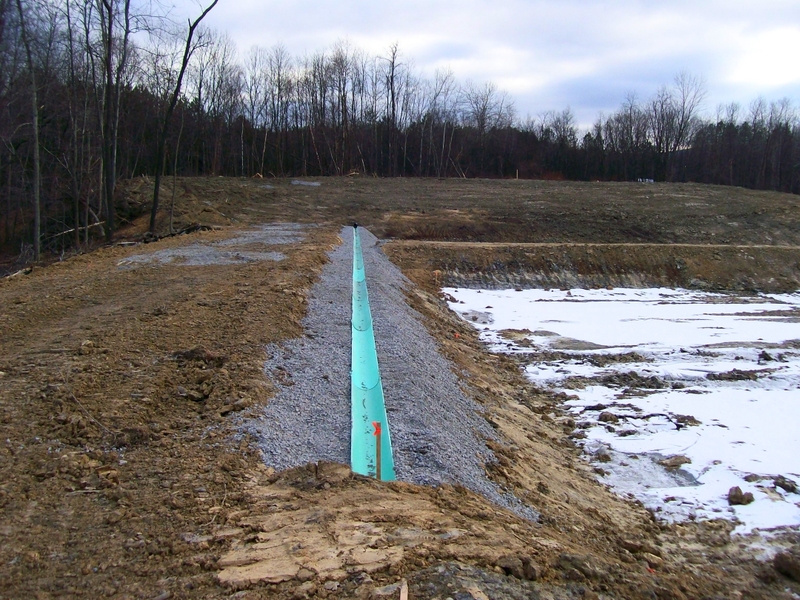 Soon thereafter, a second wetlands system (Phase II) was constructed off of Dundee Road in 1999. The success of both these initiatives spurred expansion of the Phase I system. Water from the discharge was channeled over two weirs, activating the oxidization process, into two parallel holding ponds. 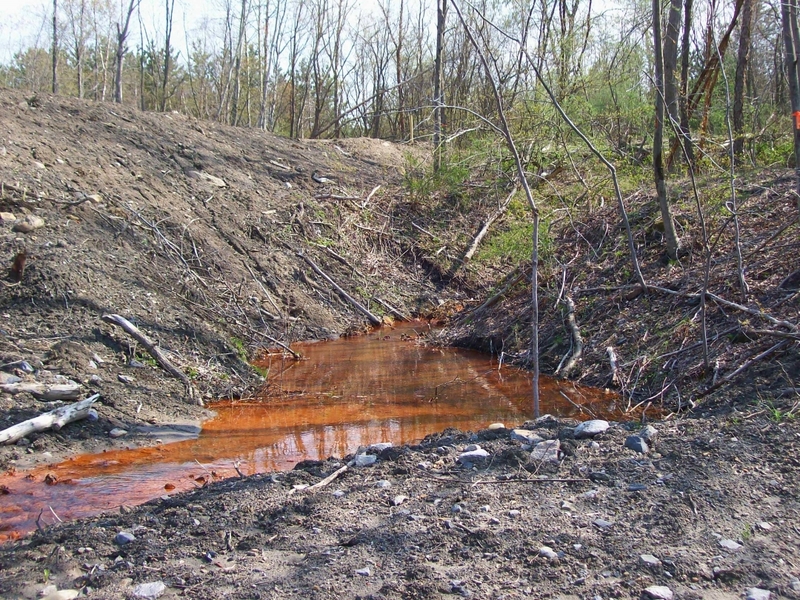 A polishing cell was then added at the system’s outlet, adding to the iron’s removal before the water’s return back into Espy Run. Funding for the initial Espy Run Constructed Wetlands and its expansion was provided by the U.S. Environmental Protection Agency and Earth Conservancy. Espy Run was considered a pilot project. It resulted in improved water quality and, as a byproduct, also increased vegetation and animal life in the area. 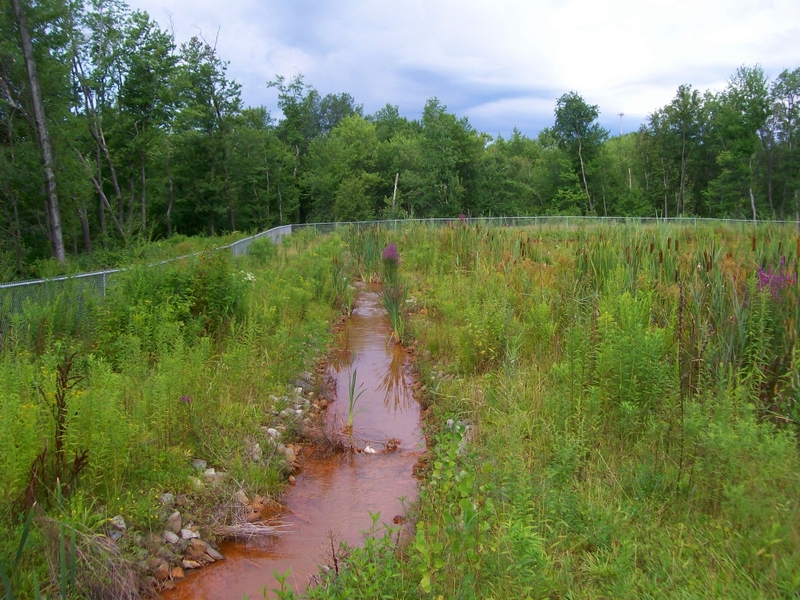 Seeing the opportunity for even greater efficacy, EC applied for and was awarded a Brownfields Cleanup grant from the EPA in 2009. Support was also given for consulting services from Hedin Environmental through a grant from Trout Unlimited; and for engineering services from the Pennsylvania Association of Conservation Districts. The enhancement of the Espy Run wetlands was completed in 2011. View of Espy Run, prior to wetlands project. Ponding of AMD-contaminated waters from the Espy Run discharge. Over time, AMD builds up in waterways, creating a thick sludge that coats both streambeds and banks, like seen here at Espy. 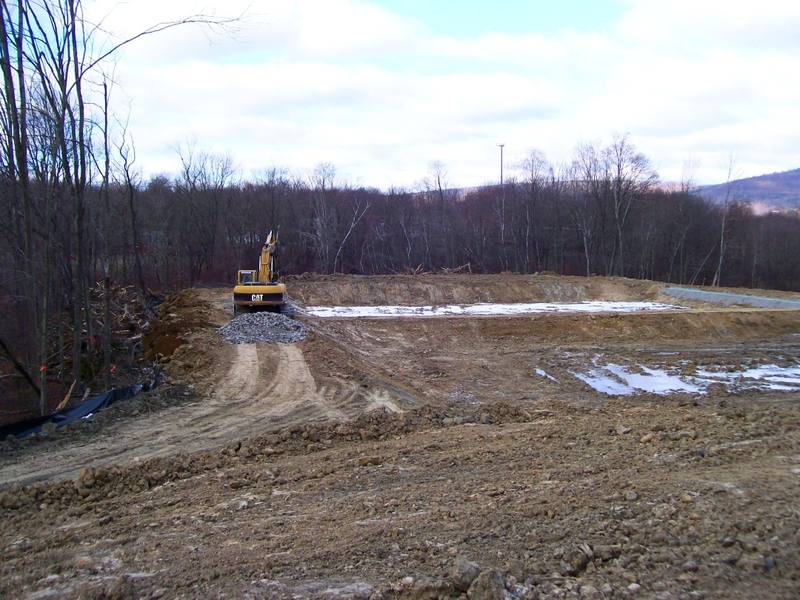 After clearing and grubbing, work began on excavating and grading for the pond structure. 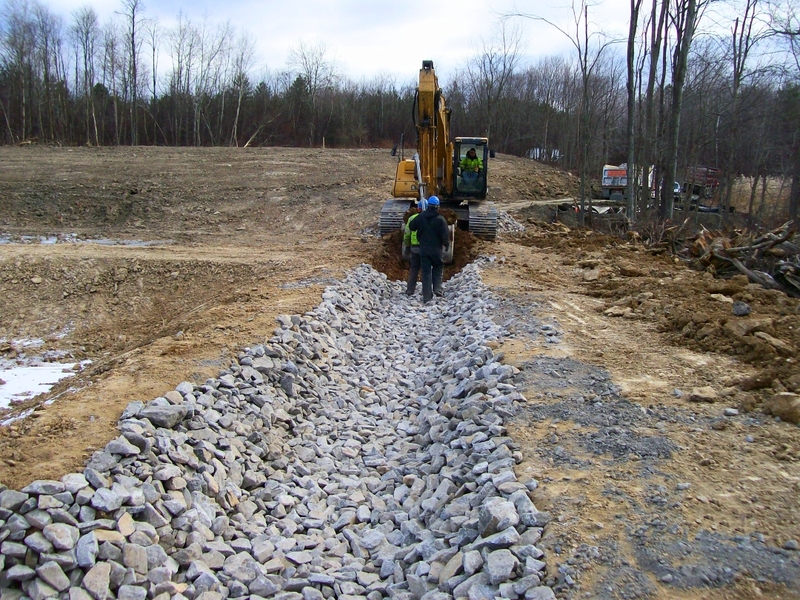 Laying of the inlet structure, which would divert waters from the Espy discharge into the wetland settling pond. Construction of the outlet for water from the settling pond. 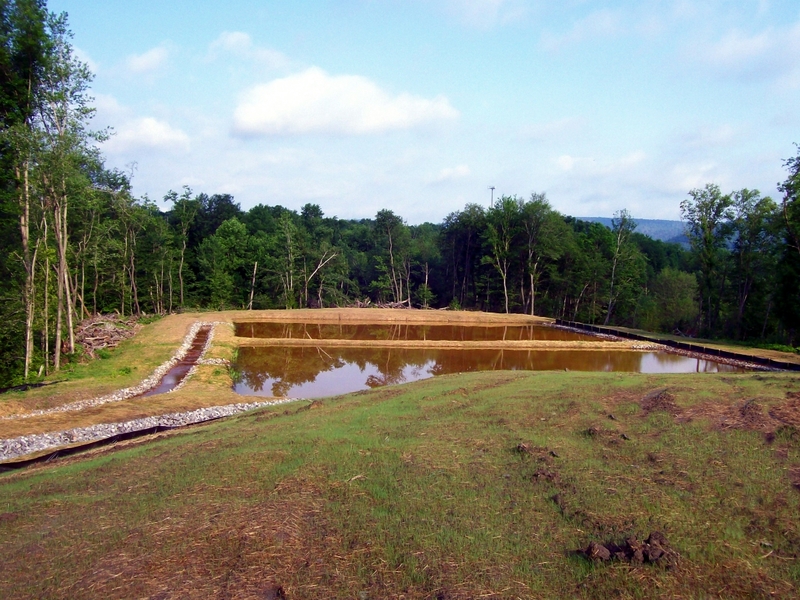 The completed dual-pond wetlands. The inlet is to the right, the outlet to the left. Grasses and cattails beginning to take root along the wetlands’ banks. The outlet structure from the Espy Run wetlands, continuing to be populated by grasses and cattails. The polishing cell at Espy – the final stage before processed waters re-enter the stream. 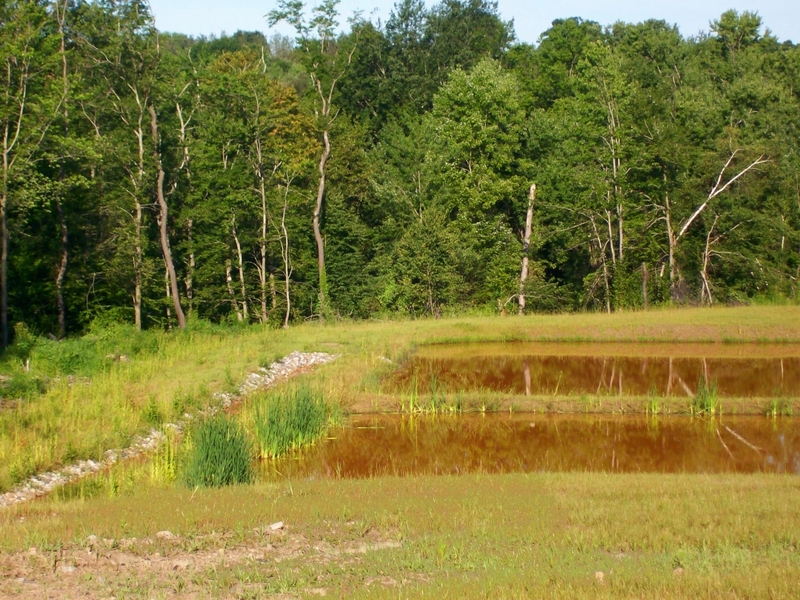 The clarity of the water demonstrates the wetlands’ effectiveness in treating AMD. 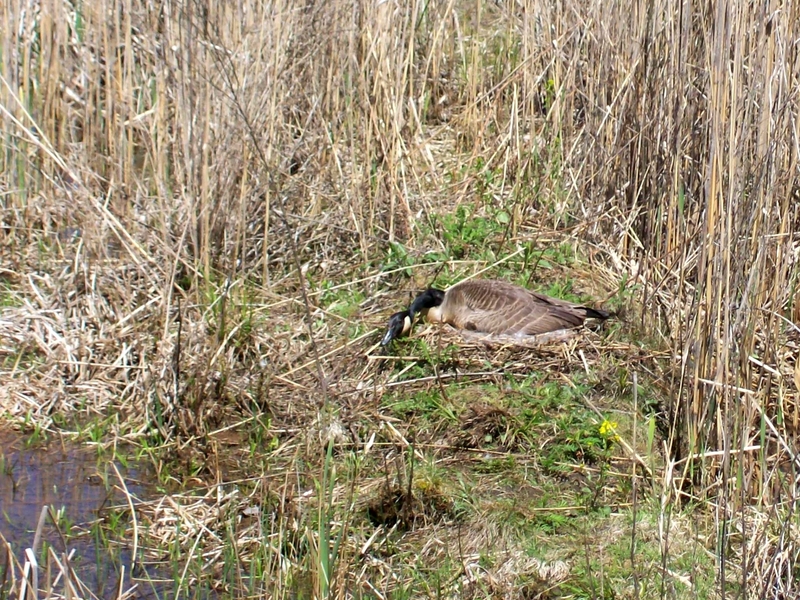 As noted, the wetlands also restores habitat for native wildlife, like the nesting Canada Goose pictured here.